Solstice is a Sceptre 41. If you want to skip the story of how we found her, you can go straight to the specs and photos. Once we decided to sail away, we started to look for the right boat. Actually, John had been doing research for awhile. 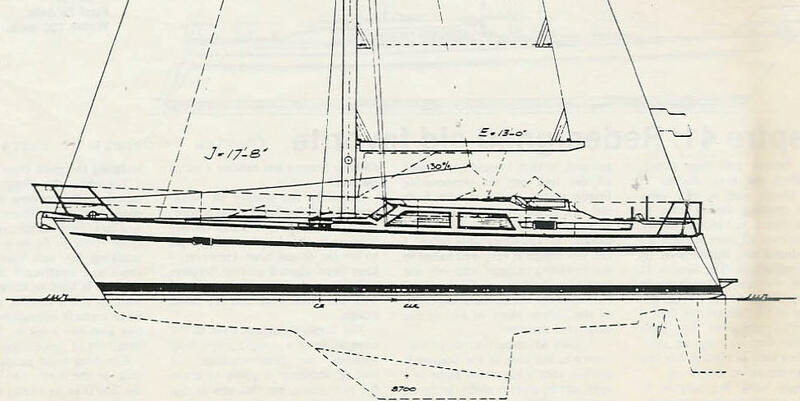 One of John's major references was a page on selecting a cruising boat on the Mahina Tiare website. John insisted that I read it before we even talked about what we wanted. At the bottom of the page is a list of boats to consider. I printed out the list, and we kept it handy as we looked at boats on the Internet and around the Bay Area. During our search we attended the Mahina Tiare Offshore Cruising Seminar (education was part of the plan). This weekend-long seminar by John Neal and Amanda Swan Neal was a great investment for us, and we learned a lot. For one thing, we learned that a boat (not on the list) that we were thinking about would not be a good choice - and why. John Neal offers consulting services for selecting a boat, and we considered going that route. But also a speaking at the seminar was Pete McGonagle of Swiftsure Yachts in Seattle. Pete didn't seem like the yacht brokers we'd met in the Bay Area. For one thing, he's very knowledgeable about bluewater boats. So we talked with Pete, and he agreed to be our buyer's representative. After that things went quickly. We continued to mine the Internet using the Yacht World site. This site includes all the boats listed by member brokers throughout the world. Most yacht brokers seem to belong so that most yachts on the market are shown. While the site has areas that are available only to brokers, the basic listings are available to the general public, and the search engine for the database is quite good. We had already looked at all the boats in the Bay Area that might suit us, so we expanded our search to include the whole West Coast. We also scheduled a trip to Seattle to see several boats that Pete thought would work for us. Even though we could see the boats online, we really need to experience them. John brought the camera and took pictures so that we could talk about the boats again in the evening. It was a whirlwind tour that reminded me of house-hunting in San Francisco. While there may be hundreds of boats or houses on the market, only a handful appear to be worth looking at. The first boat Pete showed us was also the one I'd found most intriguing on the Web. Unfortunately, she was a little bit out of our price range. 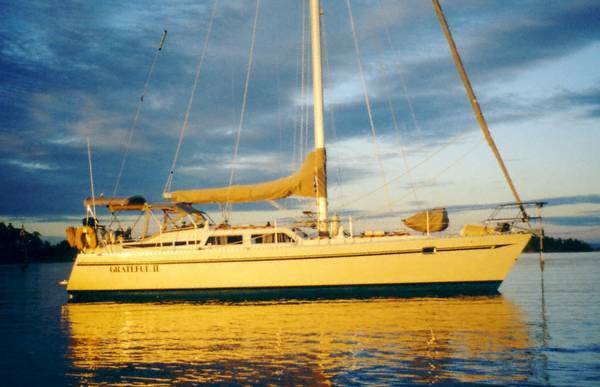 Even though we knew we could make an offer at a lower price (unlike San Francisco house-hunting when we were doing it), she needed lots of equipment to become a boat we would feel comfortable sailing back to San Francisco, much less across an ocean. So we looked at all the other boats Pete had found for us, hoping we'd find one that we would like as well. John did see other ones that would have worked, as far as he was concerned, and I was willing to make do or keep looking, but in the end, we made the offer on Solstice (or Grateful II, as she was then named). After a couple of counters, we agreed on a price that got us Solstice but left very little in the budget for the refit we needed. Fortunately, we were both still working then, so the budget could be expanded. We closed the deal at the end of May 2005, leaving Solstice in Seattle until we could come back up over the Fourth of July holiday and get her. We decided to take the boat back to her builder, Sceptre Marine, in Richmond, B.C., for the refit. We replaced the refrigeration (which wasn't working) and added lots of instruments including chart plotter, radar, SSB, and GPS. We also added wind-vane steering and a generator, but no water-maker. That was a lot of work, so we left her at Sceptre through the summer and picked her up at the end of September. The following specs and photos are from the listing on Yacht World when we bought Solstice. 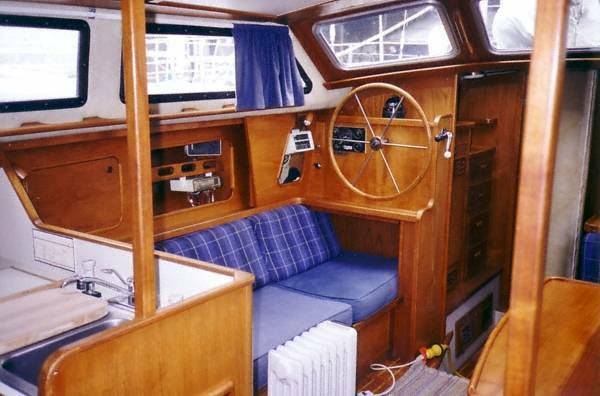 We renamed her, the upholstery has aged, and the curtains you see didn't come with the boat. Also, the tank sizes are a little off. LOA: 41' LWL: 36'	Beam: 12'8"
Displacement: 21,500 lbs. Draft: 6'1"	Ballast: 8,700 lbs. Fuel: 160 gal. Water: 232 gal. Holding: 22 gal. Profile. Someday we'll have a photo of Solstice that's as good as this one, but we don't yet. 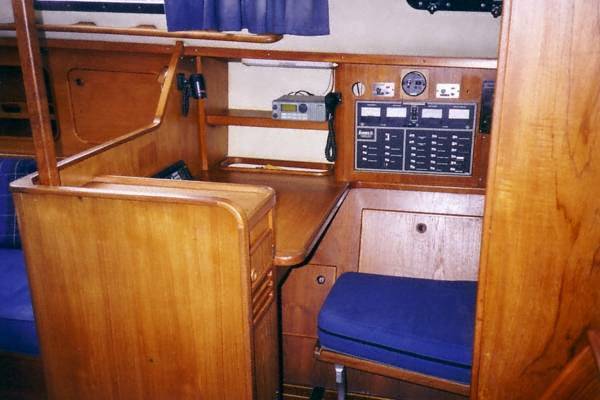 This gives you a good idea of the low lines of the pilothouse. Galley. (Kitchen to you landlubbers.) John has added quite a few things, but you get the idea. That's the refrigerator in the counter to the left. John built some shallow shelves above it, where you see the paper towels now. And there's a plexiglass cookbook holder under the port on the left. Port salon. See the wheel? Yes, we really could steer from inside, but we haven't yet. The one time it really would have been good, I forgot we could do it. The visibility is very poor from inside facing forward, and we have the auto-pilot, so the inside wheel isn't very useful. Starboard salon. John has mounted our flat computer monitor on the bulkhead, and we use it to watch DVDs and online videos. You can catch a glimpse of it on our blog. It's behind me in that photo. V-berth. This is the cabin in the bow of the boat, and it's where we sleep unless it's rough. 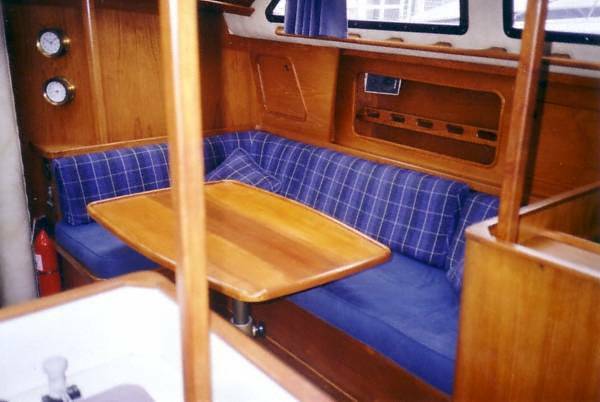 If it's rough, we use the settees in the salon or the quarter berth if we don't have crew. 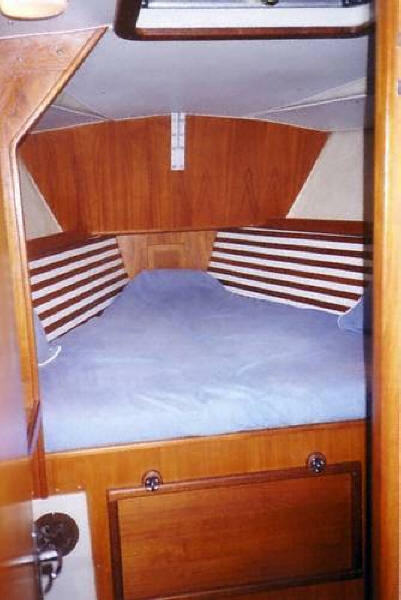 If we have crew, it is possible to sleep sideways in the v-berth so that you don't get thrown around too much. That's what we did on the delivery. 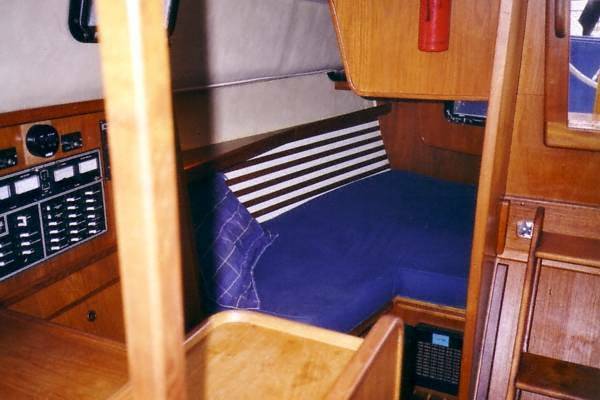 Quarter berth. This is our guest room. We proved that it's big enough for two. On our Alaska voyage, we slept here. 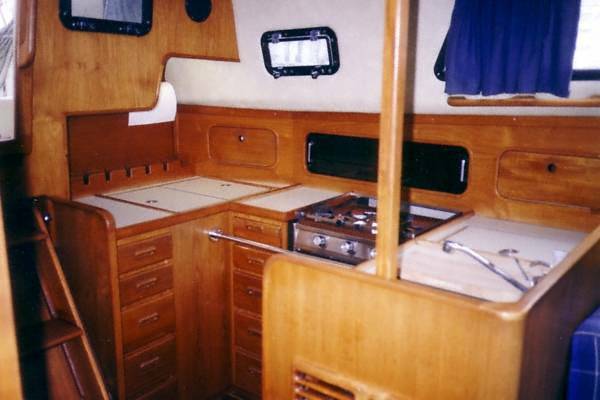 It doesn't have a door, but the nav station shields quarter berth occupants from view from the salon. Nav station. This is between the quarter berth and the salon on the starboard side. The chart plotter and ship's computer are here. We got a new seat for it, and that's where John usually sits when where down below. Check out the Sceptre 41 pages on the builder's website for more information about Solstice and her sisters.